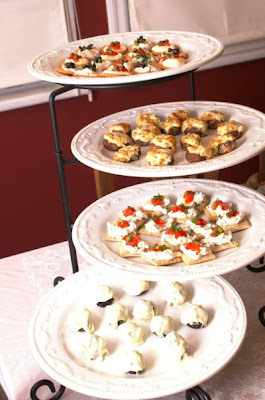 When we had a Pinochle Party back in December, I made lots of little hors d'œuvres. The one on the bottom is one of my favorites though (a dessert, not an hors d'œuvre)... Oreo Truffles! Since St. Pat's Day is tomorrow, I thought I'd try 'em with mint Oreos. 2. Stir in softened cream cheese. Use the back of a large spoon to help mash the two together. 3. Roll the mixture into 1″ balls and place on wax paper covered cookie sheet. 4. Melt chocolate as directed on the package and then dip balls into chocolate, tap off extra and set aside on wax paper covered cookie sheet to dry. 5. Once dry (if they get to that stage before you polish 'em all off), refrigerate and enjoy! these sound great - will have to try after Lent! Goodness! Those sound so good! Wish I hadn't given up chocolate! Maybe I will make them on Sunday, lol! In the mean time, these look good, and I posted a whole wheat chocolate chip cookie recipe. Enjoy! 1. Preheat oven to 400. Lightly spray medium size shallow baking dish with veggie spray. 2. Rinse chicken and pat dry. 3. In a shallow pan, combine everything but chicken and mayo. 4. Spread chicken with mayo, then coat with crumb mixture. Place in prepared dish. Rice crispies, saltines, curry and mayonnaise? My interest is piqued for sure! When we can eat meat again (oh Easter, where art thou??) I'm putting this on my menu plan. Thanks, y'all, for your contributions! I really do try the stuff you list (and thus far have not been disappointed! ).